Highway combos with a LOT more than just market, and it doesn't actually combo all that great with market - you need a lot of trashing, and some other help, usually. But it combos with gainers, grand market, bascially anything with plus buy or gain, and you are able to play many in a turn. pretty decent addition to already-working engines. Still way overrated. Cartographer works in BM. Often not as well as in engines (though, depending on the engine, Cartographer can be pretty unnecessary). Also feel that this card is way way way overrated. Uh, festival's a little high, city's a bit high, haggler's a little low, but not too too bad. I'd really like to speak out for Haggler. I mean most cards on this part of the list are either cards that have large potential, but are often weak (City, Highway, kind of Rabble), or just "boring" parts of engines (Festival, Bazaar, Upgrade). I just have something like 20 (out of 28) games where I bought Haggler, but I'm more and more surprised how well it fits into many decks. Be it BigMoney, where you take the free Golds while greening and free Silvers to Hagglers or X, or engines, where you get $2 to spend and the cheap component for free. Not even talking about what might happen in absurd KC-games. 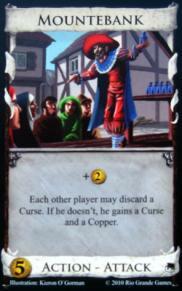 I think Haggler is by far the best card until now of the "Workshop-class" (Workshop, Ironworks, Smuggler, University, Talisman, Horn of Plenty, Haggler), because of the $2 you can easily gain a cheap and an expensive card without the "would the X have been a Silver I could have afforded the Gold anyway"-dilemma. I think I would put it above all the ones we have here. Also above Venture, Haggler->Gold/Venture is a good combo anyway. Cartographer I tend to underrate I think, Jester maybe also. Upgrade has lost much of my respect, might be underserved but it is trashing much too slow (also because of its cost). Anyway: Haggler up, Upgrade down, the rest might be quite ok, but of course swingy cards like City, Highway can also be ranked higher depending if you focus how much you rate "potential". Ok. I agree overall, but I'm surprised for Jester and Upgrade. Jester is like a bad mountebank, I like it but it seems for me way too high. Also, Upgrade is good to trash cards that became useless, like chapel or moneylender, but otherwise it's never a great addition for your deck. Also, it's good to trash cards that become useless, like chapel or moneylender, but otherwise it's never a great addition for your deck. Jester is not like mountebank at all really. If you look at it that way, you're looking at it wrong. You don't want to deal out bad things with the Jester. You want to gain good things with it. Maybe I'm misreading your post, but it seems you want to add stuff to my articles, but basically repeat what I wrote. And I definitely mentioned gainers and +Buys. 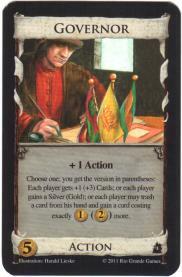 Cartographers work in BM, but not as good and it depends on the supporter card. That's why I wrote "maybe". No, I'm trying to say the stuff in your post is wrong. Uh, those go to the same game, which was played quite badly. 18 turns for 27 points with no attacks is just really weak. Like, BMU will beat that more often than not (though it would be close). I'll give you that, but you're very wishy-washy. The way you've written it (and I realize this is a nuance you might not get not being a native English speaker) implies pretty heavily that it's not good in BM. City is only that low because it is ranked by people competing mainly in 2 player games. If this was a 4 player community then the ranking would be a little different. I think the main misses here are Bazaar too high and Haggler too low. The set of cards remaining for the top 16 seems perfectly reasonable (though I personally have Haggler and Venture in there). Bazaar is too expensive to be useful as a village in most cases. One of the main uses of villages is to support draw engines, but if you're spending $5 on your village, you have a hard time buying enough of the drawing card. So for the most part, bazaar works out to be mostly a peddler, and has no business being so much higher than market. Haggler I think is underrated because it's new, but I think it's one of those $5 cards you will often want to take over gold early. It provides one less coin, but seems like it will usually make up for it with the extra gain. If you end up getting gold+$5 instead of province or $5+$3/4 instead of gold, I think you're happy with that for the most part. So you're guaranteed $2 when playing a Venture, making it another "Strictly Superior to Silver $5 Treasure Card". I don't really think Upgrade deserves its spot. It's so slow, has risks in the end game, and its rather expensive. It can be a cheat to Grand Markets, but really Remodel does that better. And other less expensive trashers like Remake, Salvager, Steward, Moneylender, and Spice Merchant just seem to offer better trashing or bigger benefits. It's nice that Upgrade is a cantrip, and that it effectively destroys curses and coppers, but it wouldn't be #18 for me. I will also admit to being one of the people that ranked Cartographer much better (I'm not sure exactly where I put it, though). A Cartographer or two can really filter out your bad cards, and cycle through your deck much quicker. In a simple Big Money game, you can skip over Greens and Coppers. In more complex engines, you'll have an easier time matching +cards to villages. I've had success using it to continuously match Barons with Estates. I might have been too generous in my ranking of it, but I don't think it should be any worse-ranked than it is here. Also, Jester is so hard to place. I think it makes sense where it is, but it's such a swingy attack. I played a game yesterday where my opponent's first three Jester plays hit my Moneylender. Do you know where a deck with 4 Moneylenders is going? Nowhere. Yeah, with Jesters, I once had a game where I was completely locked out by jesters hitting potions. And the more potions there were in my deck, the more potions the jesters hit... it was like a cursing attack that I couldn't buy and which had a larger curse pile. It sucked. - Cartographer, I had at 15 (vs. 24). That might have been a little too high, but I really think it's a massively useful card, though one people tend to overbuy, since it doesn't stack well. - Market, I had at 23 (vs. 31). I really value the +buy there. - Duke, I had at 26 (vs. 32). I think Duke is often quite strong. I had this thought a few days ago, which might help clarify: if you can get 6 Duchies and steal one Province, then you only need 4 Dukes to match your opponent’s 7 Provinces. That seems eminently doable. - Jester, I had at 27 (vs. 19). I dunno, Jester often seems pretty weak to me. Not a bad card by any means but of somewhat limited utility. - Bazaar, I had at 30 (vs. 20). I’m really not seeing why Bazaar is so high. Sure, money from a village is nice, but you have to sink extra money in them up front just to get them in your deck. AND it’s hard to get them early. AND at $5 they often conflict with the crucial parts of your engine. I also had Haggler 5 slots higher than the 23 it got here, and agree with the commentary about its strength. And I had Upgrade quite high, though I’m somewhat persuaded by the critiques of it. If I did the rankings again it would definitely be lower, though I still do think it is pretty powerful. This is a great point that also applies to Jester. 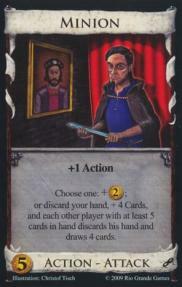 In my IRL group that plays 3-4 players, Jester is an absolute beast because of the ability to gain good cards. Often times, it is the deciding card because of the ability to gain multiple engine parts if lucky. Thus, I ranked Jester a bit higher (12) than I would have if I was only playing 2 player games. Qvist - the link in your sig for $3 cards part 1 goes to the wrong place. Thanks for all these lists Qvist, it's great to see what other people think about the cards. I used to think that Upgrade was strong because it was a cantrip trasher, then thought that it was weak because it was too slow and expensive. But on the other hand, my play group plays with it quite often (we always play with Base or Intrigue, and we've been playing Intrigue more lately), and I always notice that it does tend to tangibly speed up their deck when they buy it early, whereas I always feel like I need 3+ of them in order to get any sufficient trashing. Maybe it's confirmation bias. In the absence of other trashers, I think that Estate -> Silver is a strong move (that's $2 that you wouldn't have had otherwise), and that trashing Copper is a weaker move unless you can play Upgrade a lot and you need the Copper trashing for a slick engine. Most often if there's a strong drawing engine available, I'll build up my drawing power first before buying an Upgrade to make sure that my deck doesn't choke; I'm not sure if this is the right play, though. I think late upgrade is usually bad (which is in agreement with councilroom.com data). The best part about upgrade is the estate=>silver(or other $3 card), which is much harder to land, and much less impactful, late in the game. Removing estates, particularly in the early-going is just as useful in avoiding choking as building up your drawing power. Wow. It appears that my top 16 matches the community's top 16 exactly. Pretty impressive. That doesn't mean I don't have stuff to say about this list! None of these cards are notably underrated, though I had a few of them several spots higher; but two of them- Highway and Jester- I had significantly lower. Highway I've talked about before, unless you have a specific combo in mind it's functionally an expensive Peddler that can even anti-synergize with trash-for benefit cards. Sometimes it explodes with +Buy or Ironworks shenanigans, but we don't rank Horn of Plenty highly because it's good for some mega-turns. It's more generally useful than HoP, sometimes you actually do buy that expensive Peddler, but it's just such a trap that I have to dock it a few points. I think it compares unfavorably to Treasury, at least (and Bazaar, though I really disagree with putting Bazaar in that category to begin with). Jester may be a card I'd rank higher if I played more multiplayer games with it, but even so I find it to be just a minor annoyance most of the time. Most commonly it'll just give Coppers, which is underwhelming for a $5, sometimes you can get good cards or give Curses, but it's really inconsistent at doing that- and heck, even if you give a Curse then you've also eliminated a dead card from the top of your opponent's deck. 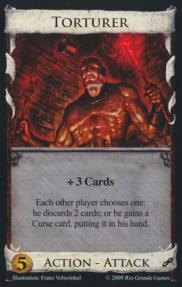 It's just not a card I'm commonly excited about using, or fearful of in the hands of my opponents. It deserves to be lower than Rabble, which at least has the occasional potential for crippling pins even if it's also skippable at times. Cartographer is a card I had several spots higher, but I think I overrated it, and agree with the overall rankings instead. It might be just about the best sifter, but, as WW pointed out, is just a sifter and as such is often not necessary. I was more enamored of this card when it came out and it's slipped a bit in my mind as I've found it's skippable more than I thought. Still pretty strong with many strategies (Tunnel, early greening in general, cantrip engines), but not a world-beater. Venture is a card I'm glad to see didn't make it into the top third, even if my placement was about the same: I do think it's overrated, and if I was making this list again would probably have ranked it even lower. The problem is that Venture really only shines in well-trimmed Big Money decks, but why are you trashing aggressively if you're not going to chain actions to begin with? I have the same problem with Venture that toaster had with Inn, and since I prefer Action decks to begin with, you can guess which of those two cards I dislike. I actually buy Venture pretty rarely, and do better without it. After Cartographer, the only card here I had more than a few spots higher was City; Bazaar and Festival I also had a spot or two higher and contrary to Qvist's Festival note, I'm not overrating it because I'm new. 'Cause I'm not new. So I guess it's up to me to defend the honor of the $5 Villages. City is often a trap card, but that's not the same as being "bad"; and furthermore it's a trap in the same way Alchemist is a trap, not the way Pirate Ship is. Though it does share with Pirate Ship the quality of being much, much better in multiplayer. Barring corner cases where you're so desperate for a Village that you'd pay $5, it's only worth it in games where at least one pile is going to run out before the end. But those games are pretty common! Most Curse matches, for instance, or games with spammable engine stacks like Minion, or University/HoP... or even just the presence of Colonies, which lengthens the game to the point that Level 2 Cities are likely to pay off. And, hey, City is a Prosperity card, so you have a better chance of playing with those Colonies. I mean, yes, it's a card you can often avoid, but (again like Alchemist) there are frequent situations where you have no choice but to go for it. As for Bazaar and Festival... Festival was for a long time my favorite card in Dominion and one of these days I'm going to write an article on it. With Bazaar, everyone keeps saying that its initial cost makes it hard to pair quickly with a $5 terminal draw card, and if you're trying to set up a Torturer chain ASAP then yes Bazaar isn't the best choice. But... really that's it. 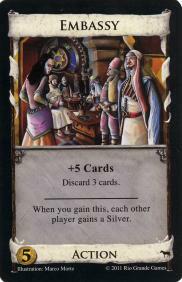 Two Bazaars in your deck is a Silver you don't need to buy early on, which can be a huge difference when you're starting to green and you might otherwise not be able to kick off to hit all your key cards: and especially if said key cards are inexpensive, you can get another one of them instead of Silver. Bazaar might work especially well on engines with cheaper drawing parts (Smithy, Watchtower, Conspirator, Pools, etc. ); more expensive parts (Nobles! ); engines where you don't need a lot of +Card parts (double-Tac), but honestly it's a strong option even with many $5 +Card terminals. Bazaar/Rabble is slow-developing but that's A-OK in a Rabble game; Bazaar/Wharf is, unlike Village/Wharf, actually worth pursuing most of the time. There are a wide variety of boards where you want both a Village-effect and disappearing cash, and the fact that Bazaar rolls both functions into one makes it a worthwhile buy even at its high price. I agree with you on City. I had it a bit higher as well, because while you can ignore it sometimes, you can ignore most of the cards at these levels sometimes. But there are actually a lot of times you simply can't ignore it. But bazaar is not even close. It's good for adding terminals to a big draw engine like scrying pool, but not much else. I'm not sure bazaar/wharf is more likely to be good than village/wharf. I would think the opposite is true. Wharf+money is so good that if you can't quickly add in the villages on the cheap (with +buy or gain), you're going to have a hard time competing. And while bazaar/smithy is better than village/smithy, it's only marginally better than smithy/money most of the time. All-in-all, it seems like one of those cards that's nice to have, but rarely plays a major role in defining a strategy, something that the top 20 $5 cards should do, imo. In this sort of game, Venture isn't simply adding a little grease to a deck that would work anyway...an unassisted, thinned BM deck in a Colony game simply isn't a good idea in general, but Venture turns it into a very strong a robust deck. You were trying to say that my post is wrong, but I'm pretty sure, we both say the same. Those two games were no perfect examples, because in one of these games I realized this combo only after a few turns (and I just realized that the copy of the link of the second game didn't work), but Market+Highway is still very strong with either a trasher or a filter card as supporter, I'm pretty sure here too. And, yes I didn't mention Gainer exactly, I was talking more in general, beacause Saboteur is no gainer and still fits the category. I would not call it wishy-washy. I know I'm not the best person to write these articles, because I'm not that good as many of you and I'm no native speaker, so sorry for misunderstandings. That's true, yes. But if these are really corner cases in my opinion. I would still call it strictly superior to Silver. Thanks for the hint. I'll change that. Another copy that didn't work. And yes, I forgot to analyze the cards in 3+ player games this time, like City or Jester. I think I add a sentence in the respective articles. After a 1.7 point gap we are now in the top third. Stables has a big outlier on the second rank and with a relatively high consensus for this region, it has no outlier in the lower ranks and was only 3 times below #30. When you try to evaluate Stables, the comparism to Laboratory is very obvious. Both give you an action and a hand with one card more. In games with no trashing a few Stables can even be stronger, because you get an additional Warehouse-like cycling effect. Just discard your Coppers and you'll see you valuable cards more often. If you buy Stables and don't play Big Money, then your action density increases and the chances that you draw no treasure cards with Stables in hand increases too. Then Stables may be a dead card in hand. Especially in cursing games Stables is weaker. And even if your only treasure card is a Gold it highly depends on your deck if you really want to discard the Gold for 3 new cards. 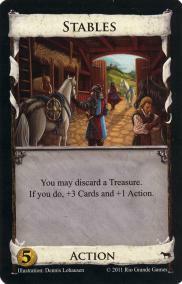 But a few Stables, Silvers and a +Buy card like Horse Traders can make pretty good Hunting-Party-like deck. An early Stables is great and superior to Laboratory on a board with no trashing, but with more Action Cards, Victory Cards or Curses, Stables is getting weaker, so just don't buy too many. Just compare a hand of 5 Laboratories and 5 Stables. Governor is the newest of all cards. That may explain the second highest deviation of all $5 cards. It was listed 7 times in the Top 10 and has a really high mode, but still has 2 big outliers in the lower regions. In the unweighted ranking it would be on #14. The different options make it difficult to play. And depending on what you choose it can a really bad card or a great one. That may also explain the high deviation. 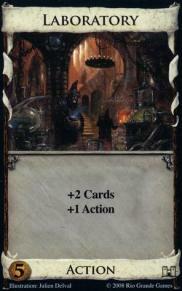 Like Council Room, the +1 card may pretty huge for your opponent if you choose +3 cards. And if you even choose that multiple times in a row, you give your opponent a great hand too. So either do that only if you a) play a discard attack afterwards, b) can end that game in a mega turn or c) possess your opponent afterwards. In all these 3 cases Governor is really powerful. The remodel effect is bad in the early game, you're helping your opponent even more for letting him trash his Coppers or get a Silver for an Estate, you can use it in the end game to remodel your treasure card in respective Victory card. 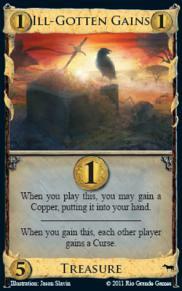 The best option without above mentioned supporting cards may be the Gold gaining. The Silver can be really bad for your opponent in a Colony game or if he builds a deck with high action density. And you can pick up Governors over Golds because you can get Golds with Governor later. That leads to a state where Governor can combo with itself. Gain many Governors, choose the gain Gold option every time. With many Governors and Gold in your deck use a few Governors for +3 cards and the rest to remodel your Gold into Provinces in a mega turn. Its power in a thin deck shows the rank #6 in the best openings for Governor/Chapel. Embassy is another card with a really high deviation. It's the first card with a first place and was above #10 3 times. And its mode is really high with being #10 4 times. Embassy is a great Big Money card. An early Embassy is so good that your opponent gets a Silver for free. The mix of a terminal drawer and a Warehouse-like filter makes it that powerful. Yes, basically it's only +2 cards, but every time you play it, you can choose the best 6 cards out of 9 cards. Similiar to Envoy: If you have 5/2 and have the luck to draw it on turn 3, you may draw it in turn 4 and 5 again and will probably have already a huge lead, due to quick cycling. But it is also good in engines if you can guarantee to draw it with an action card. So just like Wharf it combos well with Fishing Village. Here's another big gap of 2.4 points. 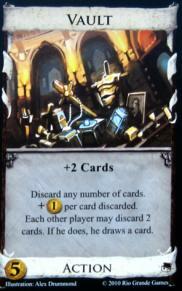 And Margrave is another card with high deviation, the third highest, shared with Venture. It was 8 times above #10. Terminal drawers with +Buy are very strong as they tend to let you have many money in hand, more you often need for a Province. 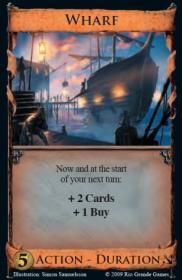 Council Room has the drawback of give your opponent another card, but Wharf is still to come in this list. Margrave gives you an additional discard attack. The discard attack itself is not as strong as Militia's or Goons' discard attack because your opponent may draw a card first. But the discard attack is still very strong. It's just like you play Council Room+Militia or Governor+Militia. Margrave is another good Big Money card. With $11 you can buy an additional Silver to your Province. And terminal draw and +Buy is all Fool's Gold needs. No surprise Margrave/Fool's Gold is the best opening on #198. It's also a good addition to your engine, but you have to be careful to add not too many Margraves to your engine, because every time you play a Margrave your opponent has another chance to draw a hand like 2 Golds and a Silver to buy a Province himself. Vault was 6 times above #10 and has 2 big outliers in the lower regions, the only 2 ranks below #30. The +2 Cards that make the difference between Secret Chamber and Vault are very important to make Vault a good card and Secret Chamber a weak one. With every play of Vault you are guaranteed a Gold or even better a Grand Market. And if you have a Gold in hand or draw one you can buy a Province for sure. This makes Vault a great counter to cursing attacks and is still great after you've gone green. No surprise your opponent has the chance to make his hand better too, because this effect is very strong. This effect makes it also a good card for Duke. Like Secret Chamber it's also good if you can draw your whole deck for example with Scrying Pool, discard all actions for a lot of money, just to draw all actions again with another Scrying Pool. Similar to this, it's great in Double Tactician decks. The downside of this card is that it's very vulnerable to discarding attacks. Although it shines in big decks with a lot of junk the #12 opening Vault/Chapel shows its strength if you are able to play it every turn. 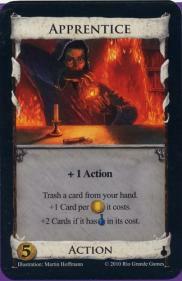 Apprentice is the first card after a while with a really low deviation. It was above #10 8 times and it's the first card with no rank below #30. And it was only 4 times below #20 too. If we declare Ill-Gotten-Gains as an Attack Card, this is the 5th best non-attack $5 card. 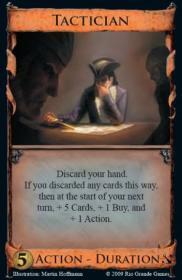 Although you can use an early Apprentice to trash your Coppers, Apprentice epitomizes (just like Salvager) Trash-for-Benefit cards; because the benefit is huge. If you don't hesitate to trash e.g. a Gold to get 6! cards and draw at least a card with +Buy or a Gainer you can really fasten the game. With Apprentice+Hoard or Apprentice+Haggler you can buy a Province nearly every turn. It combos also nice with Border Village. And as being one of the strongest Trash-for-Benefit cards, I especially mention the danger in Possession games. Your opponent won't hesitate to trash a Province or even a Colony for drawing nearly your whole deck. Now we're in the Top 10. Laboratory is the second card which reached the first place and the first with a mode better than 10 with being on #8 4 times. It was above #10 11 times and below #20 only 3 times. It's the 4th best non-attack $5 card. Unlike Stables, like mentioned above, Laboratory is a good card in nearly every deck. It increases the hand size by one which is a often underrated benefit. And if you have multiple Laboratories in your deck you have a consistent Village+Smithy engine in your deck where it isn't possible to draw dead. So, it's a engine on its own and you best begin early to build it. Therefore it's no surprise Laboratory/Chapel is on #34 in the openings list. Ghost Ship is the third card with a first place. It was below #20 5 times, resulting in a higher deviation. It was below #10 only 13 times. 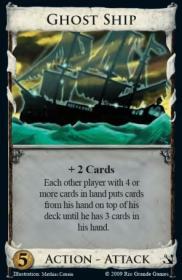 Ghost Ship is very strong because it's a discard attack in which you don't have to discard, you have to top deck. So this messes up this turn and the next turn. You have then to choose to get 2 mediocre turns or a bad turn and hopefully a better next turn if you aren't getting "ghostshipped" again. This results in really slow games in which it takes long until you reshuffle and see the newly bought cards the first time. The difference to all other strong attack cards is you don't want to play as many as you can in one turn, you just want to constantly play it each turn. That's the reason why Ghost Ship with Schemes can be devastating. If there are no good defense cards / counters, you are in a pin you aren't likely to get out soon. High consensus here. Tactician was below #20 13 times with no big outlier and #21 being a really high worst rank. It's the 3rd best non-attack $5 card. Tactician makes use of the phrase "One big turn is better than 2 mediocre ones". So in deck in that you can't guarantee a Province each turn, with Tactician it's still very likely to get 2 Provinces each 2 turns. This applies especially to cards that take profit of big hand sizes like Forge, Bank or Tournament+Province. It's also great to get key cards like King's Court early or as a defense against discarding attacks (0/8 is definitely better than 3/3). And in combination with Black Market or Action cards that let you gain virtual money like Vault/Secret Chamber, Baron or a bunch of Festivals/Conspirators/Grand Markets you can even setup a Double Tactician strategy. You can play your second Tactician in your Tactician turn and still have enough money to buy something and get another 10 card hand in the next hand. Ill-Gotten-Gains has two very big outliers in lower regions and has still a pretty high deviation. But it only was below #10 8 times. It has a really high mode, it was #4 4 times. If we count it as an Attack, it's the 5th best. I remember reading Ill-Gotten-Gains the first time and it seemed not that strong. You have only a one-shot curser to get a better Copper? The high deviation shows that many players still may think about it that way. But that's not like it is. A Ill-Gotten-Gains Rush is really strong. Just buy Ill-Gotten-Gains every time you get to $5. The optional extra Copper make that possible. With a 5/2 opening it's even possible to deal out a Curse before the opponent's first reshuffle, especially for the first player. When the IGGs are gone, the Curses are gone too, so you just have to empty the Duchy pile to win the game and IGGs give enough money to accomplish this. Often you are even able to pick up a Province in between. But you have to be sure to hit your opponent. While these Curses are nearly unstoppable, not even with Moat or Lighthouse (making IGG even stronger), with Trader or Ambassador on the board the Curse pile won't be empty if you empty the IGG pile and your opponent may have enough time to pick up enough Provinces before you empty 2 piles. The same applies with other Cursers on the board. But in all other cases when IGG is on the board, a IGG rush is probably the dominant strategy. It has currently the highest per gain win rate of all kingdom cards (1.2), even higher than Grand Market or any alternative victory card. Torturer is the 4th best Attack Card. It was below #10 only 9 times. But it has still 4 big outliers on #18 or below. It was 5 times on rank #6. The relative high deviation may result from that a single Torturer is not that great. You can choose to take a Curse in hand or discard. Taking the Curse in hand is not that great as getting it onto your discard pile or even on top. If you have a Forge or a Jack of All Trades in hand, a Curse in hand doesn't hurt you th at much. In all other cases it's just a Militia-like discarding attack. But multiple Torturers can really torture you, especially because you have a choice, but still are between the devil and the deep blue sea (I hope the phrase is right). So Torturer highly depends from Villages; especially with Border Villages or Fishing Villages a Torturer Chain is definitely the way to go. The first one that gets this set up is likely to win. When the Curses are gone, Torturers are no danger anymore. But the Curse split is likely highly in your favor and you already have a good running engine to maybe pick a few more treasures and then go green. Only with direct Cursers you may still skip them, because until you've set up this chain, there are few Curses left. Torturer/Chapel is a #42 opening and the next best ones are those paired with any $2 village like Native Village, Hamlet or Crossroads around #200. Minion is the 3rd best Attack Card, the next one from Intrigue. It was only 6 times below #10 and only 3 times below #13 - 3 really big outliers. It was 5 times on rank #6. Minion's discard attack can hit even stronger than any other discard attack. You have one card more than with Militia, but against Minion you cannot choose which card to keep. The non-terminal $2 is great in every engine and the discard option helps you to cycle faster. Those two benefits make it a self-working engine. If you win the Minion split, you can play the first Minions in your hand to get $2 and the last one to get the next 4 cards, then just proceed. And every non-terminal card with virtual coins and/or a non-terminal trasher fit very well in a Minion deck. Yes, there has to be some requirements: You are playing a 2-player game and have a thin deck and don't play with Colony, ... to name the major issues. But then a Minion deck is super strong. Minion/Chapel is the #17 best opening. After another big gap we reach the Top 4, so they are definitely the best cards. The stats of Hunting Party prove that. Its the first card with more than one first rank and it was below #10 only 3 times with none being below #20. It has the 5th lowest deviation. It's the 2nd best non-attack $5 card. 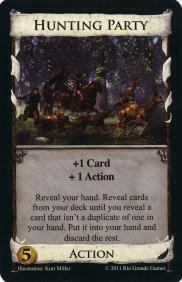 After Stables and Laboratory, Hunting Party is the best non-terminal hand-size increasing $5 card. The advantage is the even better filter effect than Stables to get the cards in hand you really need. It's also an engine on its own, just have one Gold and at least a Silver and a good terminal action which gives you at least $2, like Goons, Monument, Horse Traders, Haggler or Baron. With at least 5-6 Hunting Parties you are almost guaranteed a Province each turn because you only have few different cards in your deck and get those all in hand. Going green doesn't hurt you much (only Duchies) and with Cursers you only need a Hunting Party more to filter Curses. It's not strictly better than Laboratory if there are no different cards left in your deck, but that mostly occurs only if you already have a very strong deck or you have a heavily trimmed deck what you don't need when you go for Hunting Parties. The only thing you have to watch out in such a deck is when to trigger the reshuffle so you get at least a Hunting Party in the next hand again. Hunting Party/Chapel is the #24 best opening. Wharf is the best non-attack $5 card. There is no doubt, it's the only card with no rank below #10, so it has the lowest deviation of all $5 cards too (shared with Counting House). It was #5 6 times. What makes it so strong? +2 Cards are mostly weak. The benefit you get in this turn is pretty weak too. But the duration effect of +2 Cards without playing an action is like 2 Caravans or if you played 2 Laboratories at the start of your next turn. And Laboratory is already a #10 Card of the same cost. If you have 2 Wharves and you play them alternating each turn, you start each turn with 7 cards and basically each Wharf is a Council Room without the drawback of giving your opponent an additional card. 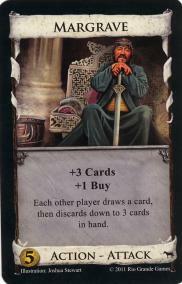 And as already mentioned the +Buy for a terminal draw is really nice too, you need it with so many cards in hand. You can use Wharf for Big Money with less probability of colliding (because of the duration effect) or you can build an engine. In combination with Fishing Village you are almost guaranteed big hands (like you're playing Double Tactician) and even have enough Actions left for Attacks. No matter if you're going Big Money or build a engine with it, Wharf is so strong that those games are over very quick. Wharf's draw and +Buy is also good for Fool's Gold, making Wharf/Fool's Gold the #44 best opening. But Wharf/Chapel is even better on #27. It was very close, but Witch is only #2. With 16 second places (more than the half) there is no doubt about such a high rank. Still it has a few outliers, 4 below #10 and two times on #7, but all other ranks were between #1 and #5. Cursers are the strongest cards in the game, I think everyone agrees. There are only 5 guaranteed Cursers, one gives you no benefit and only costs $4, another one is a one-shot and ranked #7 on this list, the third one has Potion in its cost and the fourth is a Prize Card. So Witch is a guaranteed Curser with no drawback and definitely one of the strongest cards in the game. Not only you can curse your opponent, you get 2 additional cards. Have you ever played your King's Court with Witch? This is basically "Game Over" for your opponent. The defense with Witch on the board is mostly to get it for yourself, faster than your opponent and play it more often. Witch/Chapel is the #5 best opening, but it is good with every 5/2 split. It is in the Top 100 14 times, even Witch/nothing is on #53. As already said, the decision was close, even if nearly two third of all players ranked Mountebank on #1. Because if someone hasn't voted it on #1, it was mostly considerable lower. So Mountebank has even bigger outliers and a higher deviation. Witch already is very strong, but Mountebank managed to beat it. 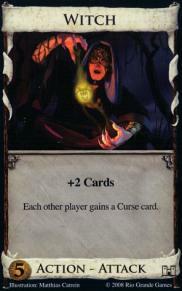 Yes, it cannot deal out curses guaranteed, but dealing out 2 junk cards per play is really strong and if the opponent has a Curse in hand, he is mostly behind in the Curse split anyway. So, it's stronger in the beginning where junk hurts you more. Your deck can get clogged up so fast. Then it may not hit every time in the middle game, but when the Curse pile is empty, you can still deal out Coppers, that's another advantage. While $2 is mostly weaker than +2 cards (especially in Colony games), there's no big difference in Cursing games as your deck has more junk and it's more difficult to get a money average of $1 per card at the start anyway. So, it really depends on the board which card is stronger, but mostly it is Mountebank because it hurts more. Just beware with Trader on the board or you may be giving your opponent 2 Silvers. Another reason for Mountebank being first is the opening list. Mountebank/Chapel is the overall best opening. Mountebank is 14 times in the Top 100 too, with Mountebank/nothing even on #29.